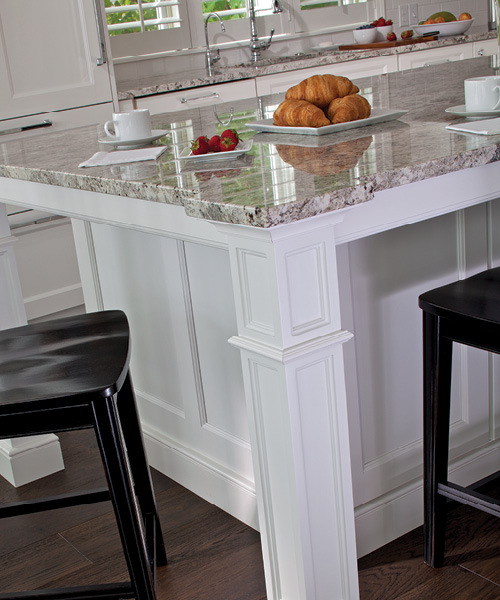 Signature Kitchens has strong partnerships with all the necessary suppliers needed to complete a total interior space. Careful consideration to quality and service is involved when selecting products. From cabinetry lines to appliance manufacturers, Signature Kitchens can provide advice on the best combination for your home and lifestyle. 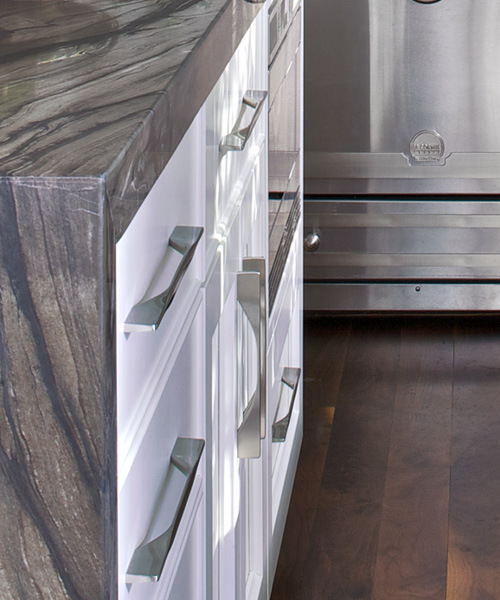 The modern kitchen is an organizational wonder thanks to an industry-wide evolution in cabinetry. Yes, there are still adjustable shelves behind some of those doors, but the options have become specialized to address tasks and storage needs. Cabinets might have rollout shelves for easy access to large pots and small appliances. Pullout bins are a useful cache for recyclables. Cabinets dedicated to canned goods work extra hard with tall, two-sided pullout racks—no more blind reaching to the back of the cabinet—and smaller vertical cabinets near the cook/prep center store spices and other seasonings. 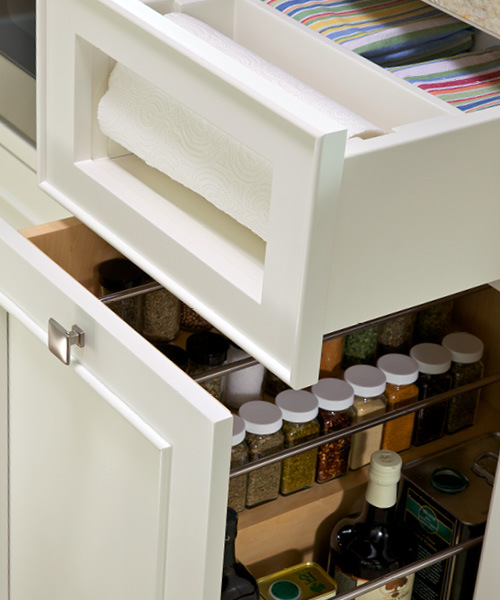 Drawers, too, have benefited from this change: custom inserts eliminate the clutter of utensils or cutlery; felt-lined drawers store and protect silver; wide shallow drawers keep table linens wrinkle-free; or deep drawers with removable peg systems store dishes. Visual impact is not forgotten, however. Decorative plate racks, custom cookbook shelves, and glass-fronted display cabinets look good, but also function well for everyday use. 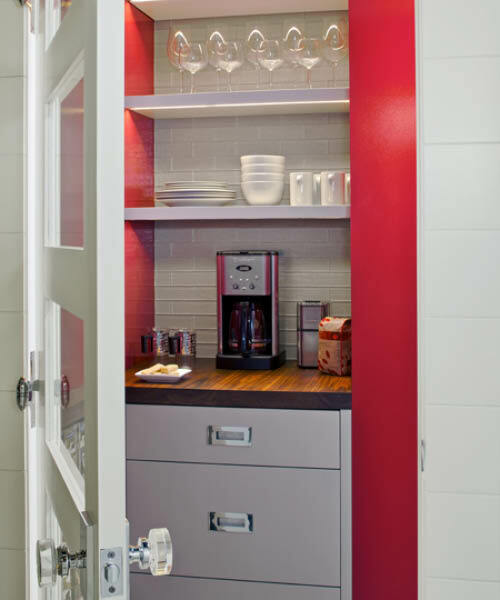 In short, custom storage keeps the kitchen in good working order. 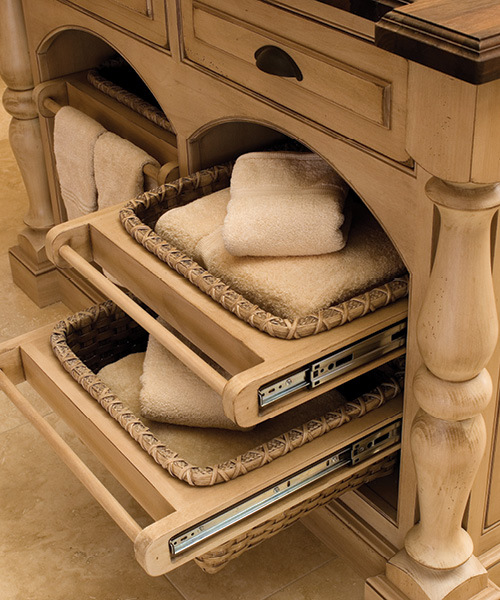 Beyond its obvious importance as storage, today’s cabinetry is in keeping with the workmanship and detailing of fine furniture. Distinctive woods, native or exotic, are rubbed, carved and coaxed to perfection. For the post-modernist, the details are in the rich grain of a fine wood, or the subtle sheen of an unexpected material such as stainless steel. A current approach calls for a generous mix of wood finishes and decorator colors. Painted cabinets—distressed, softly glazed, or finished to a high sheen—add a charge of color and work congenially with their wood counterparts. And just as colors mix, so do wood tones. It is not at all unusual for several colors and wood finishes to share space—and define task areas—in the custom kitchen. Maple and mahogany, pine and alder, for example, can easily co-exist with cream and sage, or red and blue. 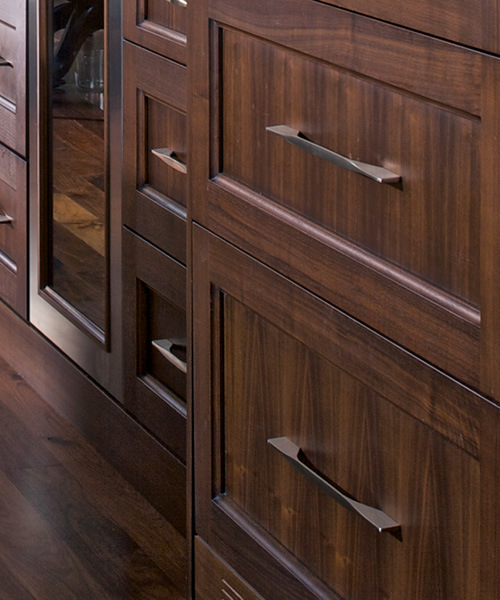 Cabinetry loves to put on a show. The rules have changed, and for the better. 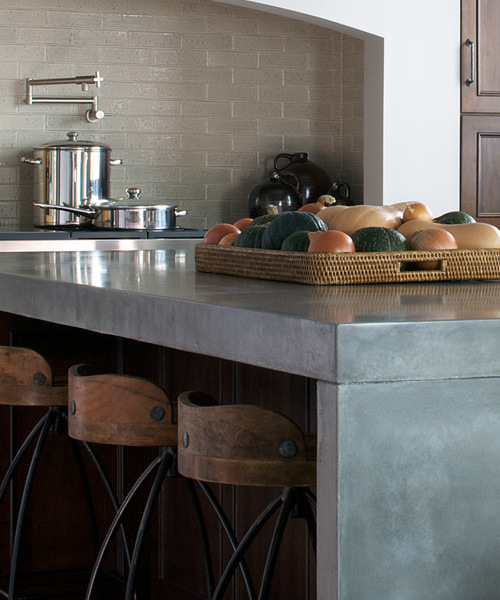 Countertops are no longer limited to one color and one texture. Instead, they have acquired new depth and dimension in which varied materials mix and complement each other. 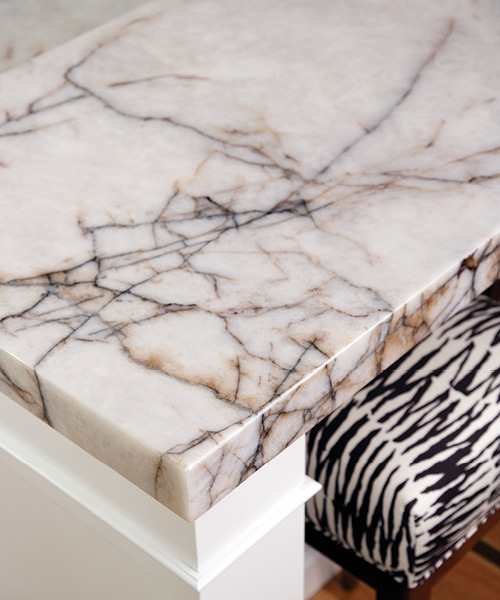 Granite can be polished to a high gloss or honed to a satiny patina. Soapstone and limestone impart a subdued and elemental touch. Exotic woods share space with traditional butcher block. Even metals such as stainless steel and copper, and unexpected materials such as concrete, are found in the newest kitchens. Not to be outdone, synthetic surfaces, including laminates and aggregate stone-like products, give incredible flexibility in color choice. 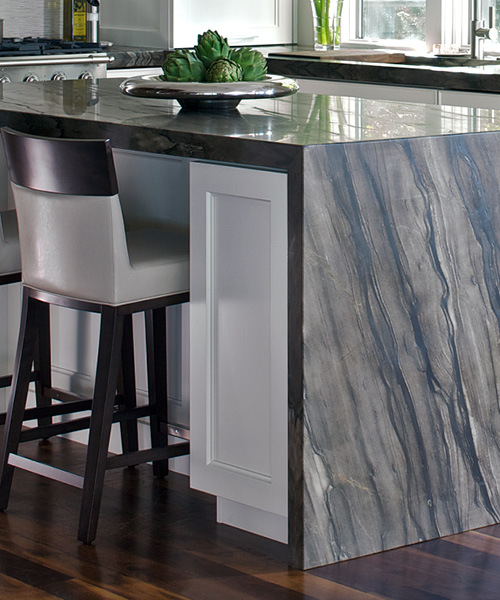 But countertops are far more interesting in a design sense: thicknesses vary; edges are rounded, ogeed, beveled, or straight; varied counter heights accommodate specific chores and, at the same time, add visual interest. An accent counter, in wood or copper, for example, creates appeal and delineates between functions. White or pink? Avocado or burnt orange? Almond or stainless? We can tell the decades by the color of our appliances, but now our choices are far more diverse than color. Today’s appliances have been deconstructed and reconfigured to perform their basic tasks in more convenient ways and in multiple locations. It’s a strategy that makes sense and contributes to a new sense of ease in the kitchen. 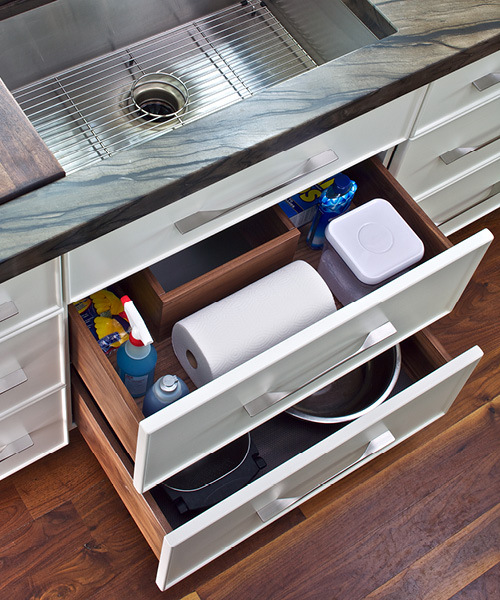 Streamlined components integrated into the cabinetry are key to this new way of thinking. Drawers, for example, function as refrigerators, dishwashers, freezers, and microwaves. Have one or multiples in strategic locations for prep, cooking, clean-up, and entertaining. 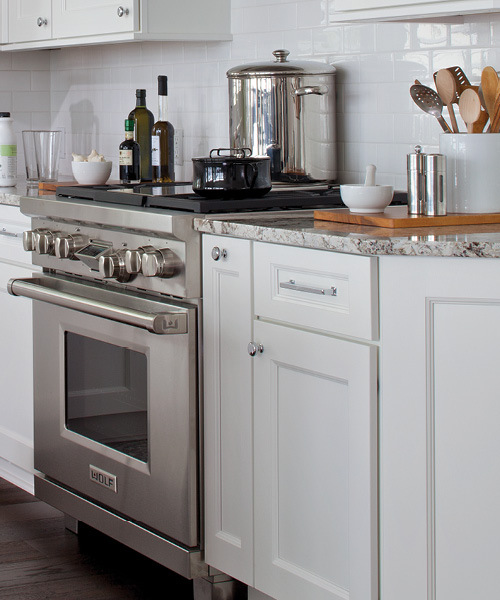 Wine coolers, once considered extravagant, have become the must-have item in many kitchens. Newer to the American kitchen, but gaining steady ground, are built-in computerized coffee makers, ready and able to brew a single cup of coffee, espresso, or cappuccino on demand. Microwave and convection ovens can handle virtually any task on their own, or lend back-up to the European ranges that anchor the well-planned room. 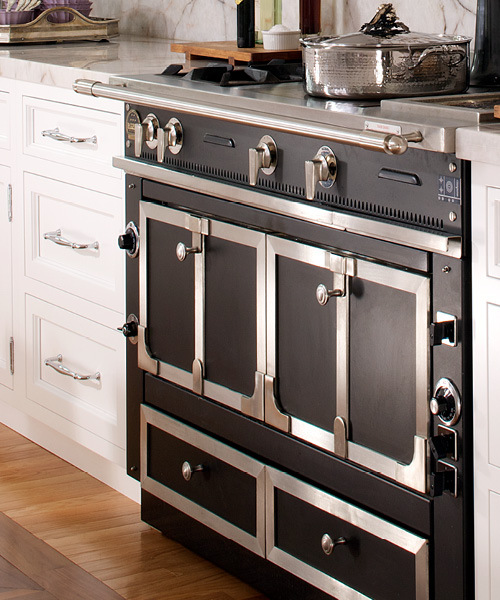 Cooktops, too, have evolved to serve multiple needs. Grills, woks, steamers, and combination gas/electric burners are routine features. 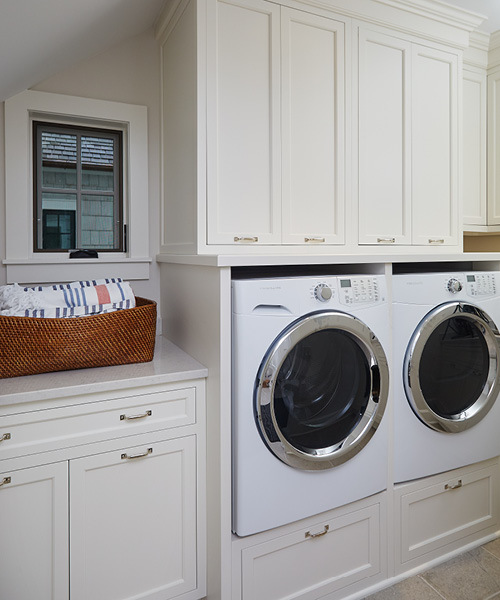 Out of sight—but all-important—are the structural supports, venting systems, and power sources needed to accommodate these myriad appliance choices. 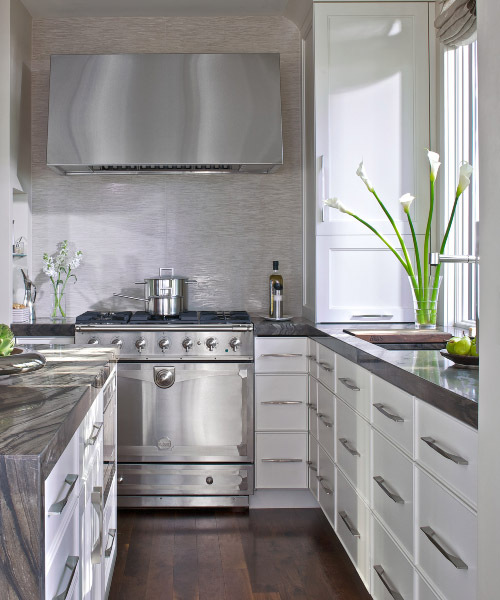 In fact, choosing appliances and their locations is a crucial early step in kitchen planning. The kitchen sink is far more than the utilitarian catch-all it once was. 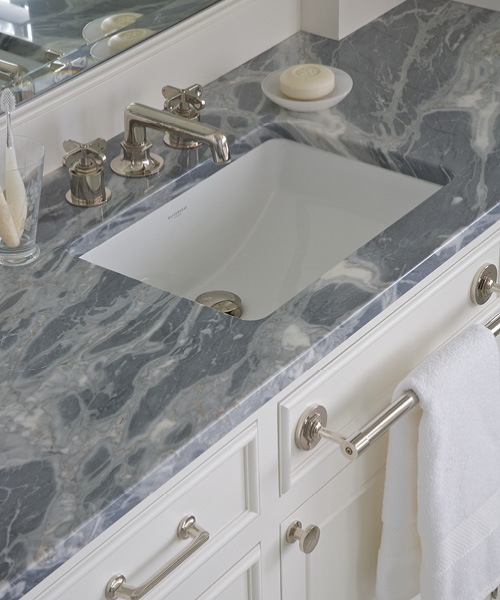 Basins have been restyled for function and relocated for convenience; and while the traditional double sink is still common, it is not the only choice. 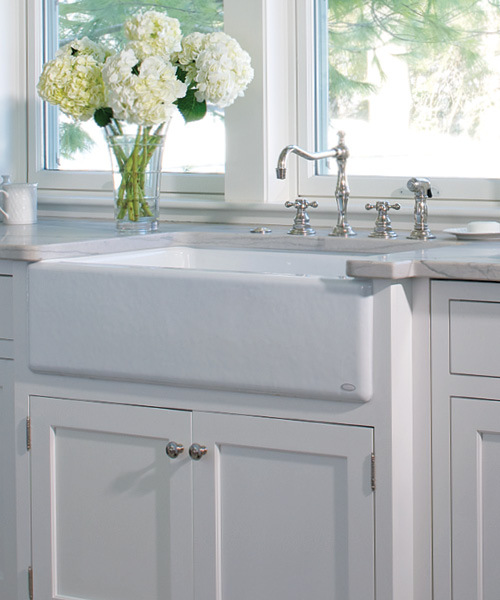 Small specialized sinks are strategically placed for particular jobs—a prep sink near a refrigerator drawer or cooktop, another at the children’s snack center, and still another in the entertainment area. 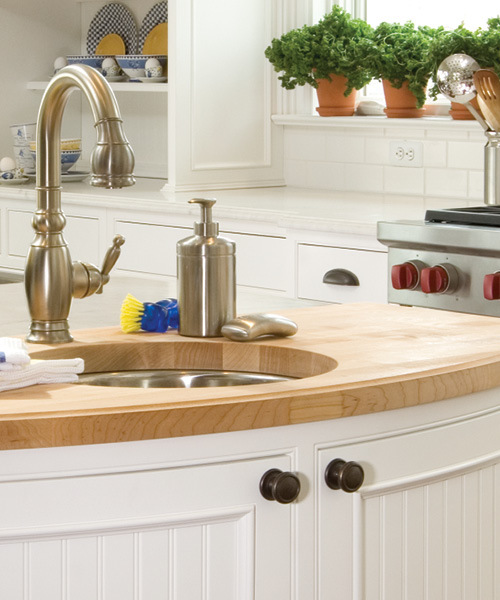 Remarkably, major manufacturers now offer sink centers that include a burner with integrated cooking vessel and set-in cutting board. Task centers combine meal planning, storage, prep, and clean-up in one flowing unit. Stylistically, the choices are seemingly endless. Materials as diverse as porcelain, enamel-coated cast iron, metal, stone, and synthetics are commonly used. 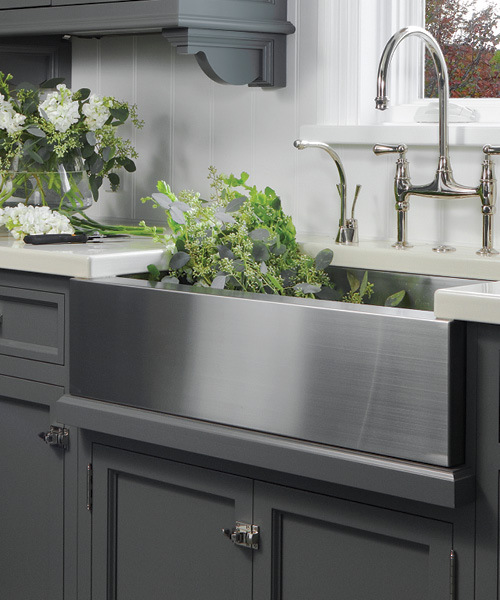 Whether one-of-a-kind, free form, high style, or nostalgic, sinks are highly visible components of the total kitchen design. 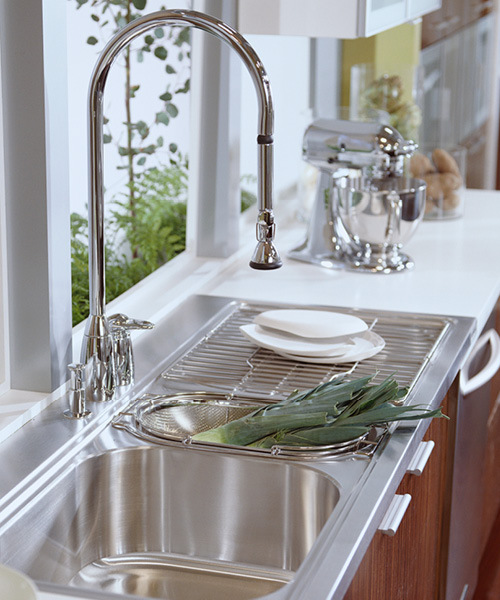 Likewise, faucets must perform—the stove-side pot-filler faucet is a good example—but not without a keen sense of style. 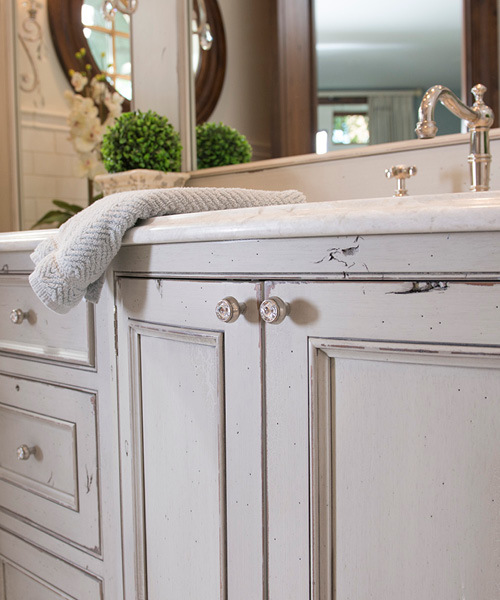 Faucet handles might be polished, rubbed, or distressed, or fitted out with embellishments of stone, porcelain, or wood. It is a happy marriage of utility and artistry. Finally, the custom kitchen is embellished with the “jewelry” of the design process: the knobs, pulls, hinges, and handles that unify and punctuate the room’s individual style. Hardware might be fanciful or austere, hand wrought or cast, but it always carries with it a sense of both ornamentation and utility. 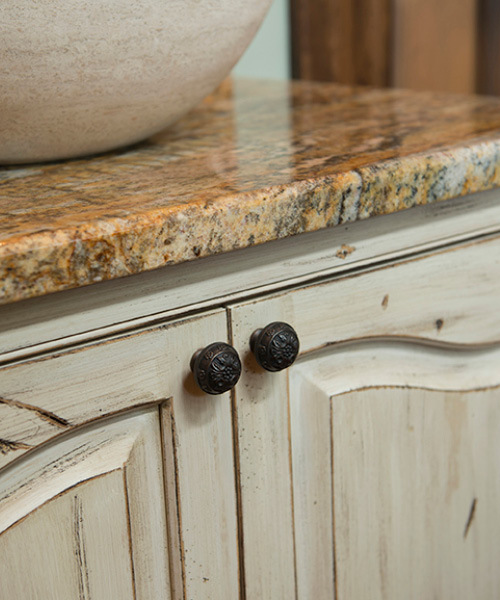 Stone, metal, wood, glass, and ceramic are just some of the materials that find their way onto cabinetry. 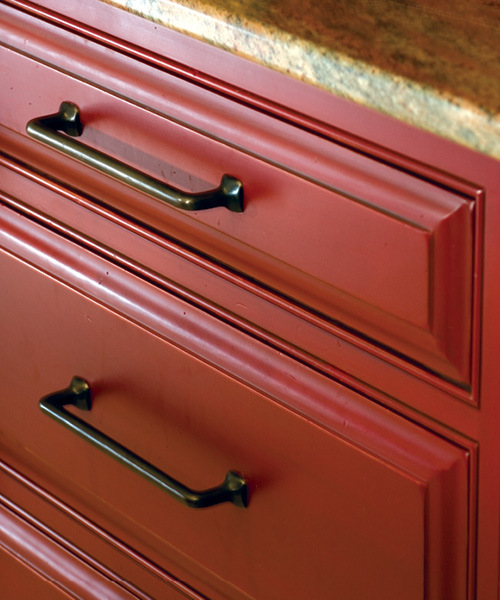 In a practical sense, the hardware chosen for the custom kitchen must be appropriate to the task at hand. Integrated appliances, for example, necessitate the use of larger handles; a dishwasher or refrigerator drawer requires hardware that is easy to grip. 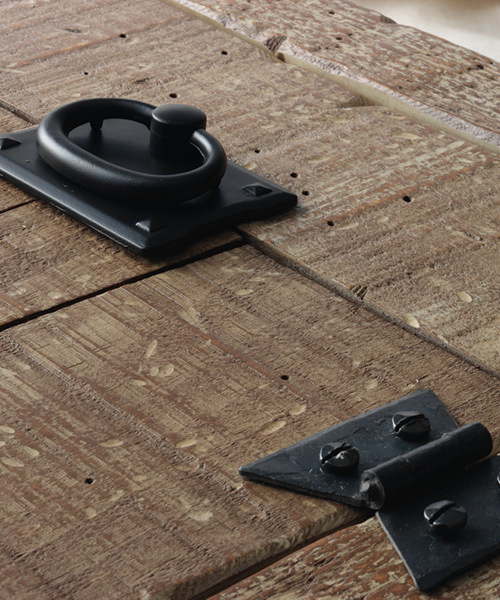 Likewise, for a smaller single-use cabinet, a delicate handle or pull will do. And like all jewelry, a few good pieces always make a sophisticated statement.